The most successful anti-Semitic film the Nazi's ever made. With Jud Süss being the most commercially successful of the three. Long recognized as history’s most incendiary film, Jud Süss was the cultural centerpiece in Joseph Goebbels’ campaign against the Jews. Released in 1940, it was a box office sensation across Germany and Europe; alongside the movie’s theatrical distribution, it became a staple of Nazi propaganda evenings organized by the Hitler Youth, SS and others. The film as based on a historical novel, "Jud Süss "written in 1925 by best selling author Lion Feuchtwanger, a Munich born playright, novelist and also a Jew. 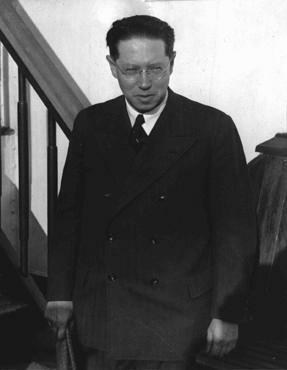 Feuchtwanger's Jud Süss was an international bestseller and was translated into over twenty languages. The book was also adapted for the stage by Ashley Dukes in the UK in 1929 and later inspired a film version by English director Lothar Mendes in 1934. 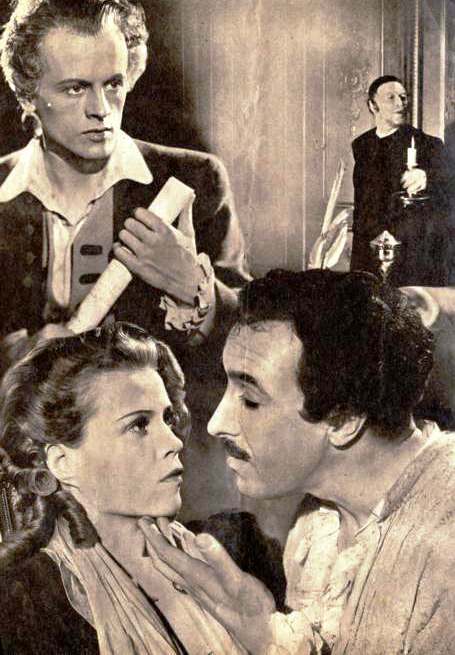 But it wasn't until Goebbels saw the British film-adaptation did he realized the anti-Semitic potential the material had, if interpreted not as a human tragedy, but as a tale of Jewish arrogance and infiltration. Goebbels foray into the film for propaganda was not new, it had been part of the strategy designed by the National Socialist German Workers Party as early as 1930, when the party first established a film department. In order to maximize the effect for propaganda potential, Goebbels took control of the entire German film industry and even nationalized film production and distribution. A state-run professional school for politically reliable film-makers "The Deutsche Filmakademie Babelsberg" was founded, and membership of an official professional organization "The Reichsfilmkammer" was made mandatory for all actors, film-makers, distributors etc, film criticism was prohibited and a national film award "The Deutscher Filmpreis" was established. "The Hassidic religious service had a demonic effect... The performance was suggestive of... an exorcism"
For that Synagogue scene, and others, Harlan chose "racially pure Jewish extras" from the Ghettos in Prague. 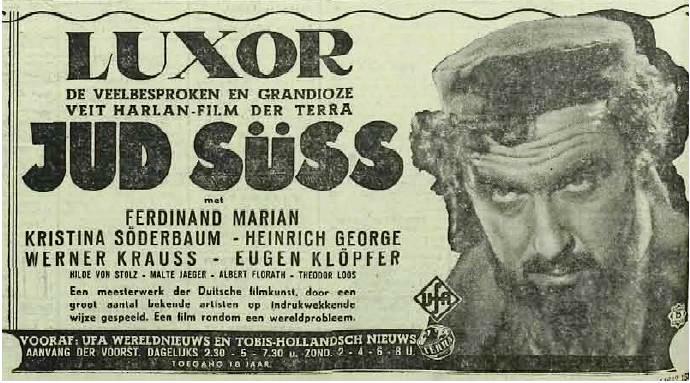 Jud Süss was considered Veit Harlan's most significant accomplishment in that he produced an entertaining film with very stereotypical undertones, with the end result being an almost pseudo form of brainwashing to the psyche of the unsuspecting viewer, many people claimed to have taken away from the film a heightened "Germanic pride." "An anti-Semitic film of the kind we could only wish for. I am happy about it". 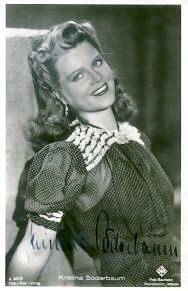 Jud Süss was launched at the Venice Film Fesitival in September 1940, to extraordinary acclaim; it recieved the "Golden Lion" award and rave reviews. "Now it surpasses all expectations. No film has yet succeeded in having such an impact on wide segments of the public. Even people who rarely attend the cinema don't want to miss this film." Duke Karl Alexander of Württemberg takes an oath to the constitution as he begins his reign, promising to do everything "according to old Württemberg loyalty and honesty." But shortly after becoming duke, he wants to hold his own with neighboring sovereigns, and demands a personal guard, an opera, and a ballet. 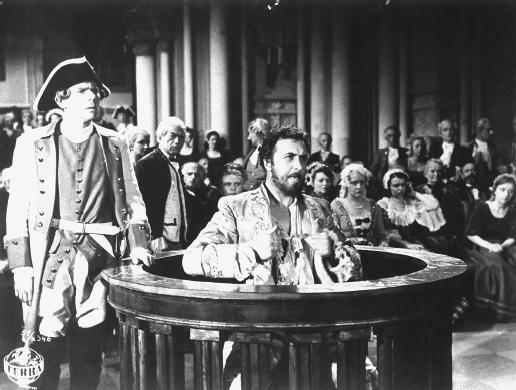 The provincial council, headed by Counselor Sturm, turns down the duke's demands. But he knows what to do. He sends Herr von Remchingen, a practiced courtier, to Frankfurt to find the Jew Süss Oppenheimer, who sees his chance. Like a thief, he sneaks across the Württemberg border and shows the duke how to make money. "Does not the emperor in Vienna have his financial advisers, whom he allows to collect taxes, customs duties, and bridge tolls?" The citizens of Württemberg complain, but the small rebellions that break here and there against the steadily growing taxes and crude methods of the Jew's officials are brutally suppressed. The smith Hans Bogner is hanged because, driven to desperation by the Jew and his lackeys, he answers force with force. The duke is satisfied with his Jew. Süss transforms Württemberg into a land "flowing with milk and honey." He finds new ways to finance the duke's expensive tastes, and Süss himself gets rich too. Karl Alexander rewards the Jew for his matchmaking services with new privileges and with a letter giving him immunity from the law. The ban on Jews is lifted. Hundreds of Jews move to Württemberg and Süss makes sure that they can all get rich. Röder, the duke's war comrade, attempts in vain to make himself the spokesman for the ruined farmers and citizens. Karl Alexander brusquely rejects him. The old Rabbi Loew, who knows how to read the stars, vainly warns Süss Oppenheimer: "The Lord punishes Jews who forget who they are!" Süss continues on his way, even attempting to marry Dorothea, the daughter of Counselor Sturm, who is engaged to Faber. Sturm stops him, and Faber and Dorothea are married. Under the pretext that Sturm is leading a conspiracy against the duke, Süss has him arrested. When the council resists the duke's arbitrary use of power, he dissolves it, thus breaking the oath he took upon becoming duke. Following the advice of the Jew, he determines on a coup to make himself the absolute monarch. This forces Süss's opponents to act. Until then they had hesitated, but now they must rouse the people. They send Faber out with secret orders. He is arrested at the city gate. The password has been changed that night. Faber is accused of treason. Since he will not reveal is accomplices, he is tortured. Afraid, Dorothea goes to the Jew. Süss releases Faber. But at what price? A few hours after his release, Faber carries the body of his young wife from the Neckar River. Now rebellion breaks out! Röder is the leader. The duke, who would gladly be out of the situation that Jew Süss has got him into, uses the presence of the emperor's emissary in Ludwigsburg to leave Stuttgart, giving Süss a free hand to carry out the coup. He dies of a heart attack during the festivities at Ludwigsburg, which renders void his grant of immunity that gave the Jew immunity for all his crimes. Süss is arrested as he tries to escape. He is tried and condemned to death. The smith's relatives build the highest gallows ever constructed for the Jew. And all Jews have to leave the province within a month. On September 30,1940 Reichsführer SS, Heinrich Himmler, ordered all SS and police members to see the film during the coming winter. It was shown to SS units, and Einsatzgruppen about to be sent east on their murderous assignment, and was also sent to non-Jewish populations of areas where Jews were about to be deported, by 1943 viewership of the film was reported as over 20.3 million people. 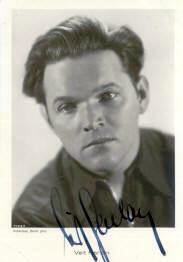 Veit Harlan, received the 1943 Universum Film Archiv award, but after the war his notoriety faded. Harlan was the only film director of the Third Reich to be tried for crimes against humanity. The prosecutors choosing to focus on his use of the SS to recruit (persuade) ghetto Jews to perform as extras. Harlan was determined to depict German Jews as Eastern Jews to justify their expulsion from Germany, Harlan sought extras first in Lublin in January 1940, but later settled on Jews from the Prague ghetto. Harlan was later acquitted on all counts. 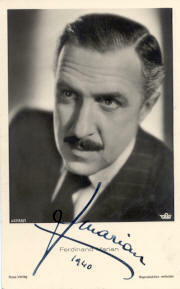 The star of the film Ferdinand Marian was banned from a career on film after the war. When he died in a car accident on 7th August 1946, it was rumored that he had committed suicide. 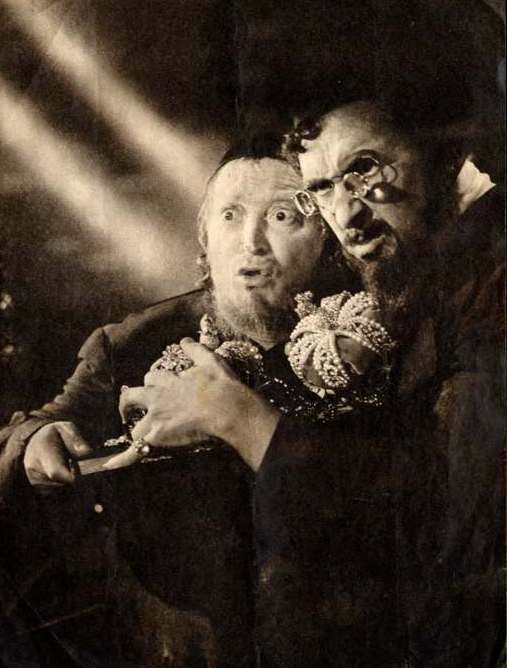 Jud Süss was the most notorious yet most successful anti-Semitic feature film ever made. The Holocaust and the Moving Image: Representations in Film and Television Since 1933 Published by Wallflower Press (London, New York).